Hulk Elvis. Gagosian Gallery, London, England [June 4 - July 27, 2007] pp. 81, 109, 110, 112 (installation views), illustrated in color. Champion, Julie and Nicolas Liucci-Goutnikov. Jeff Koons: La Retrospective: The Portfolio of the Exhibition. France: Centre Pompidou, 2014, p. 137. Champion, Julie and Caroline Edde. 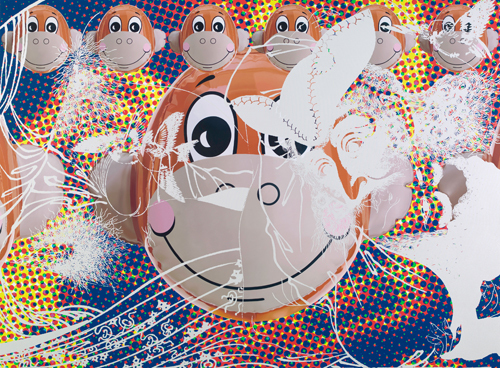 Jeff Koons: La Retrospective: The Album of the Exhibition. Exh. cat., Belgium: Centre Pompidou, 2014, p. 50. Koons, Jeff and Norman Rosenthal. Jeff Koons: Entretiens avec Norman Rosenthal. Hove, England: Thames & Hudson, 2014, p. 168 [French Edition]. Koons, Jeff and Norman Rosenthal. Jeff Koons: Conversations with Norman Rosenthal. China: Thames & Hudson, 2014. p. 168 [English Edition]. Koons, Jeff [guest editor]. “Jeff Koons: Profile, Head to Head with Stella McCartney, Artwork.” Wallpaper October 2007. "Summer Quotes." Art + Auction June 2007, pp. 6-7, illustrated. Art Review (issue 10) April 2007, illustrated in color (detail). “Body Language.” Vogue December 2005, pp. 323, illustrated.